This is a super little naturally polished piece of Whitby Jet. While not always thought of as a fossil, it really is one. This piece is a lovely naturally worn piece, worn down smooth by the action of the waves on the beaches where it was collected. it would be a nice artifact to carry in the pocket and examine when you have a spare moment....! You won't receive this exact piece, but one very similar and measuring roughly 3cm across. Boxed and labelled and complete with a signed certificate of authenticity. 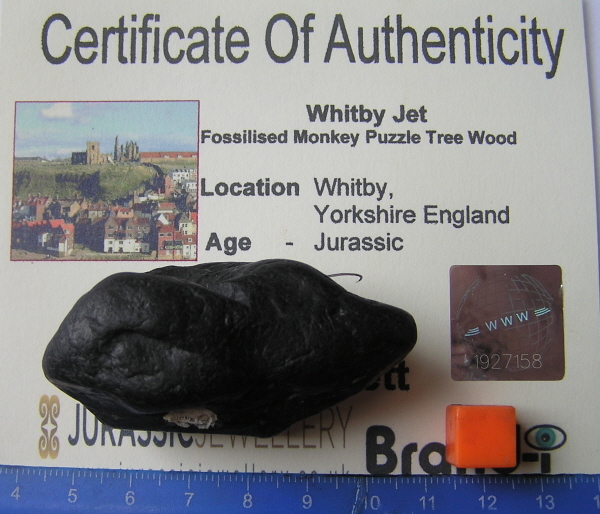 Jet is found mainly locally between the cliffs of Whitby and Staithes although mining works have taken place as far inland as Bilsdale, Rosedale and Great Ayton. Jet is a form of fossilised drift wood created over a period of 120 million years. it is believed that Jet comes from the Araucaria tree known in the common name of the Monkey puzzle tree. When the trees became imbedded in a thick layer of sedimentary rock they began to fossilise and turn to Jet. Jet is a combination of several chemicals the most common being carbon, Hydrogen, nitrogen, sulphur and oxygen. Trace elements include silicon, potassium, calcium, iron, copper and aluminium. I have spent a long time looking for some Jet to offer with my other fossil items and I plan on making some jewellery with it soon.